If there’s something strange, in your neighborhood…who ya gonna call? Doorbusters?? You read that right; Doorbusters. Let’s face it. The doors in our home are super strange “and they don’t look good” (I swear I’ll stop with the Ghostbusters references now). So we decided a simple upgrade would go a long way. Of course, nothing we ever do is simple because this house was built from scratch by the previous owner and it was a 1-owner home. Until now, no one has come in and done a major overhaul on the place. We currently have what are called Luan doors. They are flat-panel and plain, plain, plain. 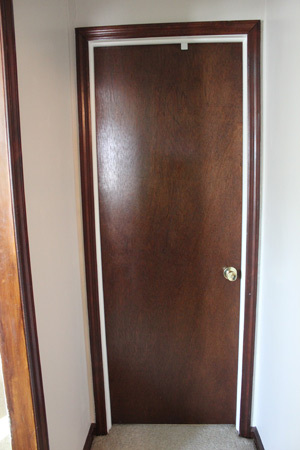 Not to mention, they’re all painted/stained with this ugly brown color and you know our mantra; “down with brown.” Obviously we needed to eliminate these awful doors, but challenges presented themselves almost immediately. No two doors or doorways in our home are alike! 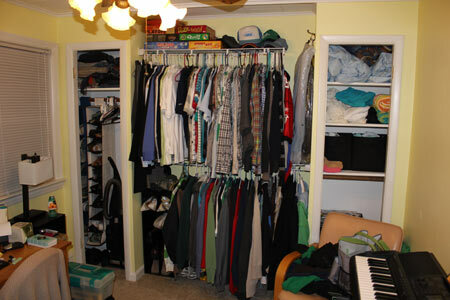 The office and our bedroom are identical in size, yet the doors and doorways are off by a quarter inch or so. Since we knew this wouldn’t be easy, we decided to start off with ordering just one door – the bathroom. It’s the smaller of the 3 doors and would ultimately present the biggest challenge, so we figured if we could get this one right, we could definitely do the other 2 no problem. We ordered our door from our trusty friends in Millwork over at our local Lowes. The same person who sold us our Pergo flooring for our kitchen helped us with our door. While we were at it, we ordered two bi-fold doors for the closets in the office, shown below with the old dingy doors removed. The bi-fold doors will also be 6 panel, giving us that clean-cut, new home look we’ve been craving. Of course, nothing in our house is a standard size, including the doors. Thus, we had to special order. This upped the price a bit from about $30 per door to $50 or so, but no matter what we did, the door was going to have to be custom. The bathroom door arrived about 2 weeks after we ordered it (the bi-folds are still M.I.A.) so we picked it up and blocked out an entire Sunday to tame the beast. We started by laying the door down on a drop cloth so we could paint the 1st side. We went about our business and once the paint dried on side 1, we flipped the sucker over and painted side 2. While waiting for side 2 to dry, we ran out to Lowes and got all the supplies we needed; new hinges, new wood screws and a new door knob. 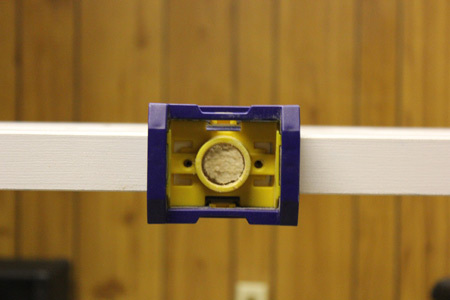 Then it was time for the hard part…cutting the hole for the door knob. Andrew has gotten really good at using the jigsaw and other cutting tools. We do a lot of cutting in our house, not sure why. Anyway…this handy door lock install kit was really easy to use. The pictures don’t show the door “before” but we started with a solid door. 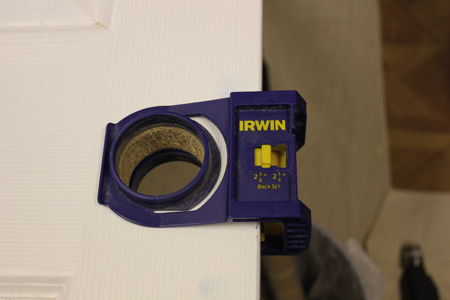 We measured the height and attached the Irwin Door Lock Template. The template came with a saw that attaches and is powered by a regular drill. 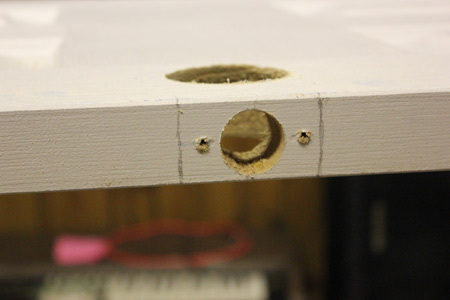 The saw cuts the hole for the door knob as well as the side, without moving or removing the template. It’s not like cutting through solid hard wood or anything so the whole process is relatively quick and easy. 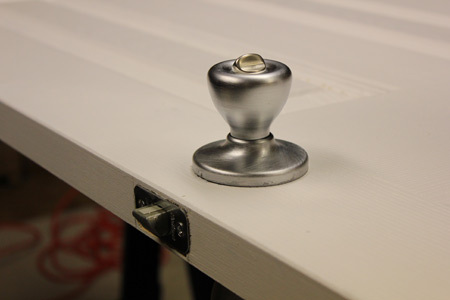 In retrospect, maybe we should have cut the hole for the door knob/lock first and then painted because we ended up having to touch up some marks that were made in the cutting process. I think that’s what we’ll have to do when we tackle the rest of the doors. 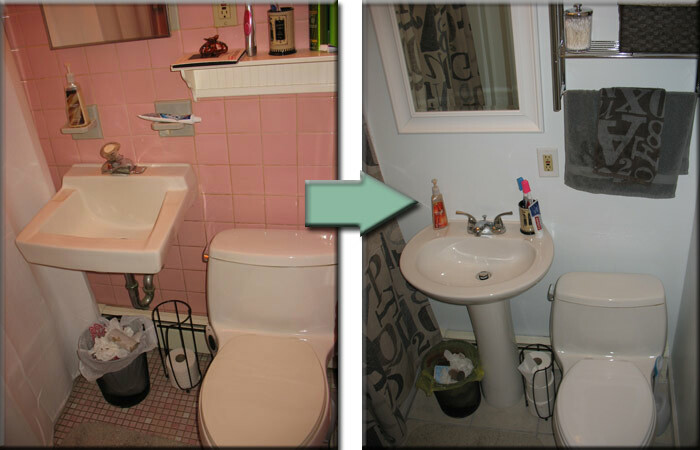 Once the holes were cut, we installed the lock and door knob. Then it was onto the hinges. And that, my friends, is a story for another day. Cutting for hinges requires chiseling and we just don’t have the time or the space to continue this saga right now. You’ll have to check back for our next update to see how it all turned out!